True Wild Life | Clown Fish | The clown fish (also known as the anemonefish) is a small species of fish that is found around tropical coral reefs. The most commonly known species of clown fish is orange with white markings but clown fish can be found in many different colours and can also differ in shape. There are 28 recognised species of clown fish that are found in the Indian and Pacific Oceans. The clown fish is also found as far north as the Red Sea and inhabits the Great Barrier Reef, on the Australian east coast. 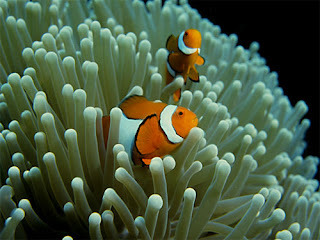 The clown fish was made most famous from the popular children's film Finding Nemo . Aquatic stores and clown fish breeders reported a significant increase in the popularity of the clown fish although many people did not realise the work that goes into keeping marine fish so sadly, the majority of clown fish bought at the time quickly died. The clown fish is also famous for it's seeming immunity to the stings of the sea anemone. 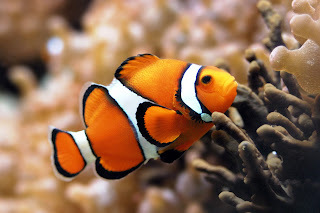 Most clown fish are found either in or around sea anemones which the clown fish inhabits both for protection from predators but also the readiness of food. Clown fish inhabit a single sea anemone in groups that include the breeding male and female and a number of younger male clown fish. All clown fish are born male and develop female reproductive organs when needed. When the female in the sea anemone group dies, the dominant male becomes female and breeds with one the males that is inhabiting the same sea anemone. 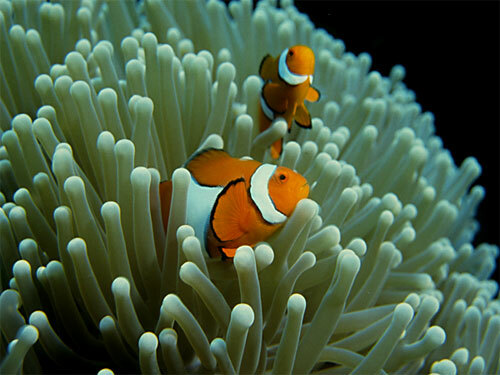 Female clown fish lay their eggs on a flat surface close to the sea anemone which they inhabit. The female clown fish can lay hundreds or thousands of eggs at one time depending on the species. Clown fish lay their eggs around the same time as a full moon and the male clown fish guards the eggs until they hatch just over a week later. Clown fish are omnivorous animals meaning that they eat both plants and animals. Clown fish eat a wide range of food such as algae, plankton, molluscs and small crustaceans. 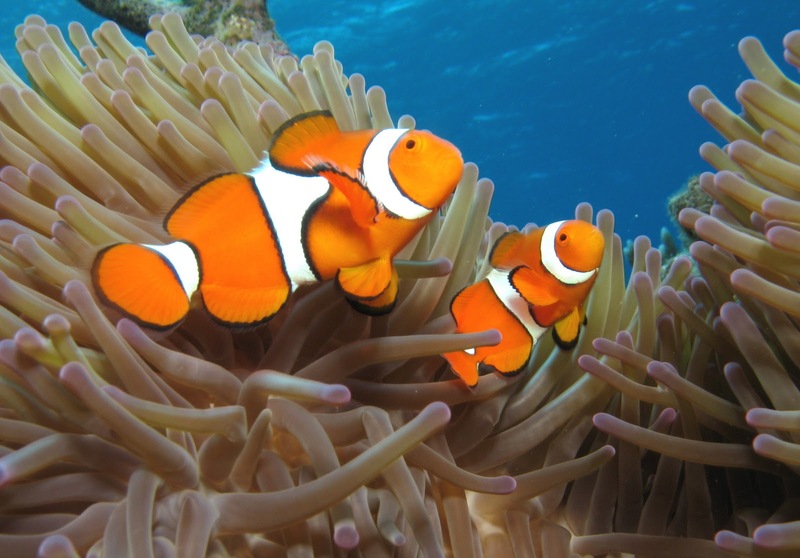 The diet of the clown fish is however largely dependent on the species of clown fish and what food is available in the area which they inhabit. Due to their small size, clown fish are preyed upon by a number of predators but can be difficult to catch are they often retreat into the safety of the sea anemone. Large species of fish, sharks and eels are the main predators of the clown fish in the water but the human is the biggest overall threat to the clown fish as they are caught to keep in tanks and aquariums. Despite the rising levels of pollution in the world's oceans and destruction of the habitats on the ocean floor, clown fish are not considered to be a threatened species of animal mainly because they lay so many eggs at a time. Even though not all of the clown fish eggs will hatch, a vast number of clown fish fry hatch in every spawn meaning that clown fish numbers remain high in the wild. 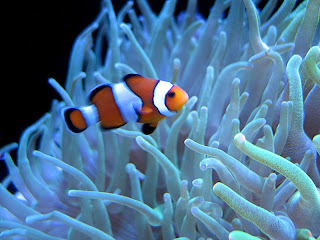 The clown fish (also called the anemonefish) is a small species of fish that's found round tropical coral reefs. 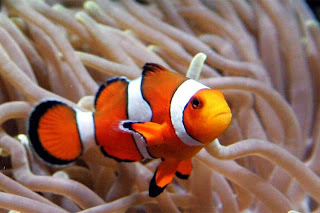 Essentially the most generally recognized species of clown fish is orange with white markings however clown fish can be found in many various colours and can even differ in shape. This is a pretty cool article. i never knew some of it!!!!!!!! the clown fish is the sexiest fish in the sea. hands down. how much do the clown fish cost? I just bought a clownfish yesterday. I guess it depends on which kind you get so there are many diffrent color and types of cholw fish. We paid 25.00 dollars for our bright orange and white clownfish.